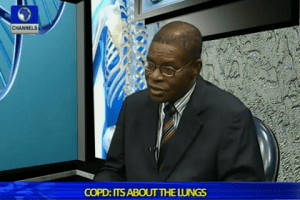 Chronic Obstructive Pulmonary Disease, also known as COPD, is an under-diagnoses and serious lung condition which has implications for breathing. W.H.O estimates that in 2004, 64 million people suffered from it, almost 90% of them in low and middle income countries. It is more common in men but the women are catching up, the top health body says, if there are no quick interventions to reduce risks, deaths from COPD may go up by 30% in the next ten years. A Consultant and Chest Physician at Lagos University Teaching Hospital, Idi – Araba, Dr. Cyril Chukwu, explains more about the COPD.